The foks at J!nx are absolutely brilliant. 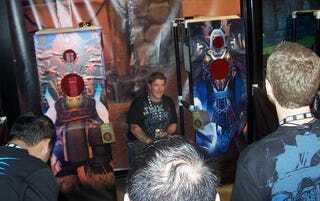 Wanting to bring something other than hats, shirts, and gurgling murlocs to the BlizzCon 2008 party, they've come up with a way to combine all the competition of a PVP arena with the carnival fun of tossing bean bags through holes, the J!nx PVP Arena. While I had missed it on Friday due to swarms of murloc-hungry fans, late Saturday night I got a chance to try my hand at an extremely entertaining way to play World of Warcraft without technically playing World of Warcraft. Here's how it works. Basically you have two targets, side by side, each with a large hole in the center (1 point) and a smaller hole near the top (2 points). Teams of two players take turns throwing a set number of bean bags through the holes, after which hits are calculated and a winner is declared. So how is this World of Warcraft?It's a bit more complicated than that. Before each round, all players choose a character class. On my play through, for instance, I went with a mage. Each class has a set number of standard white bean bags, along with one red crit bean bag worth double points and a number of green ability bean bags. My mage came with the ability Ice Block, which required me to get the green ability bag through a hole in order to negate one of the opposing team's hits. Other classes have more appropriate special abilities, like the hunter, who gets to toss three green multi-shot bean bags at once before the round starts. Other classes have positional abilities. The shooting area is cordoned off into a number of colored lines, with players shooting from the farthest white line. Warriors, however, get the charge ability, which allows then the move up to the front red line for a toss before the round starts. The shaman class has a totem ability that moves their entire team up one line for the duration of the round. J!nx only just revealed the game at BlizzCon 2008, so of course there are still tweaks being made to the rule set. Saturday morning, after noticing some balancing issues, they rolled out patch 1.1, which took away the ability for two shamen to stack their totems, giving unfair advantage, while the rogue lost one of its two crit balls in favor of a green stealth ball they get to throw before the round starts. There were prizes to be had for teams that won consecutive rounds, but these were prizes my trembling hands were not to touch. I missed my crit, my ice block, and the majority of the normal shots, doing a grand total of 1 point of damage, which is about how I generally fare during PVP. I did have a great deal of fun though, and judging by the people who had been there playing for hours, others did too. I'm not sure if the J!nx folks will follow my suggestion and market the game immediately, so you might want to keep an eye out for them at WoW-themed events to get your hands on the game. They really did do an excellent job of translating the game experience into a more physical, social affair.